The restaurant area has a similar vibe to Fig and Olive across the street. The bar has a pristine white marble top, the dining area has a romantic candle lit setting, there are beautiful chandeliers everywhere and delicate detailing that extends to the vent covers. I arrived when it was still sunny out and liked how light and clean the place looked, it was elegant and modern with bright white lines everywhere. 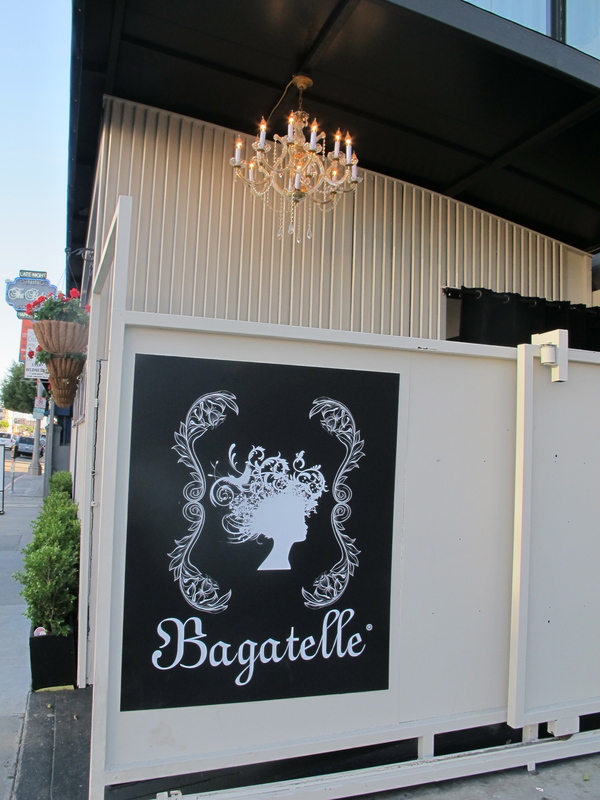 The Bagatelle symbol (a silhouette of a woman’s head that sort of reminds me of medusa) and the ornate plaster moldings around the restaurant brought ‘Jasperware’ to mind. 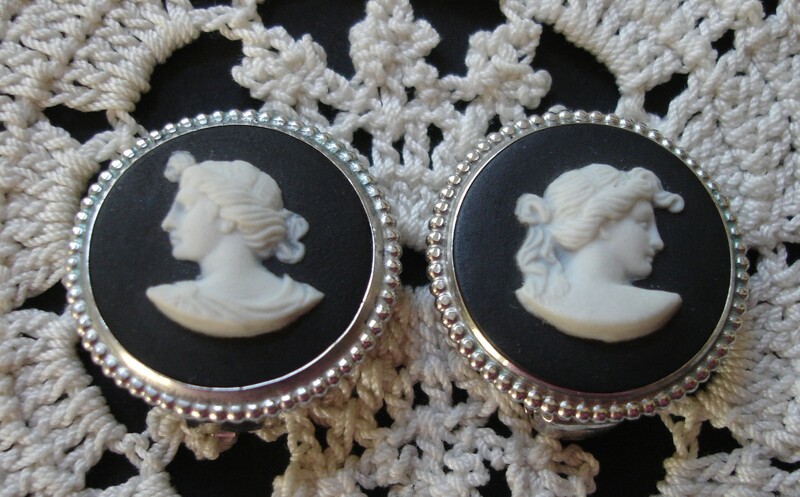 Jasperware are pottery pieces originally designed by Josiah Wedgewood, a British potter from 18th Century whose signature pieces are matte ceramics of carved or moulded classical figures and silhouettes, usually heads. 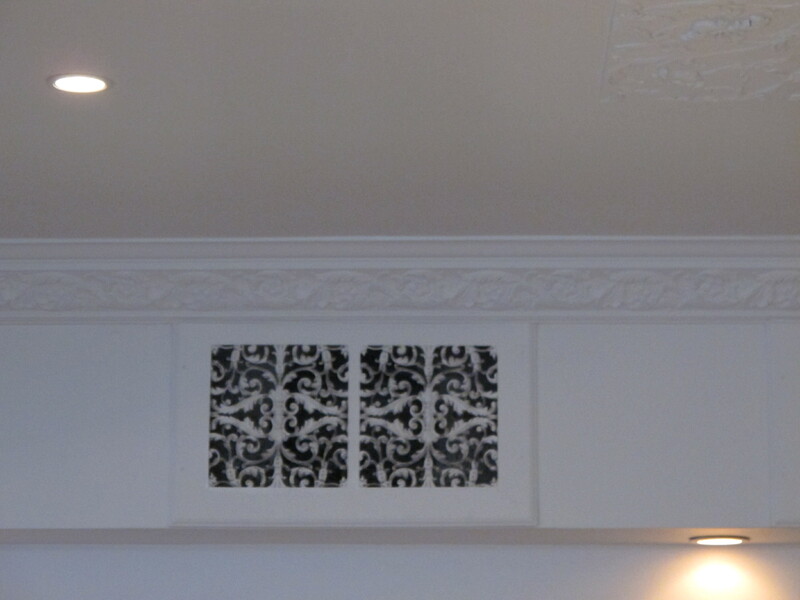 The Jasperware basalt black with white figurine (shown in the picture below) sprung to my mind as soon as I entered the restaurant, mainly because of the Bagatelle symbol but also because of all the stencil shapes and raised white moldings that surround the room on the banisters and the staircase. 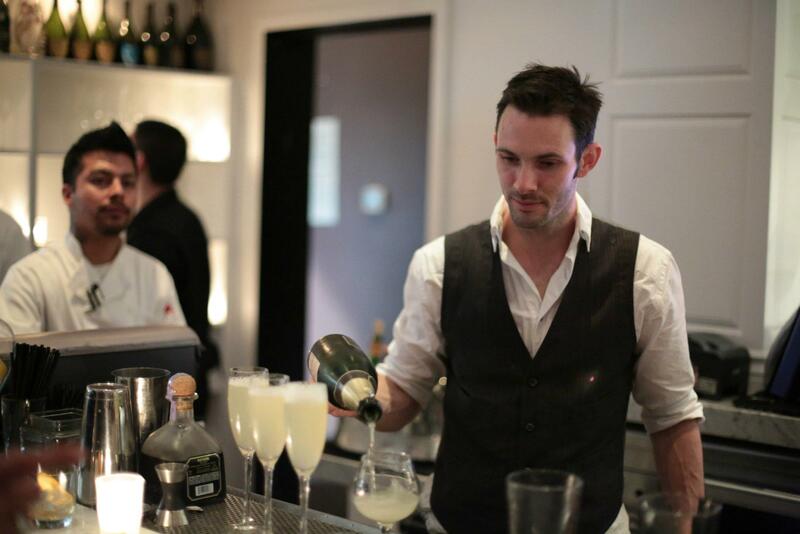 Zach Patterson is the head barman here and designed a drink menu that works well for the different genres of customer that come through the door. 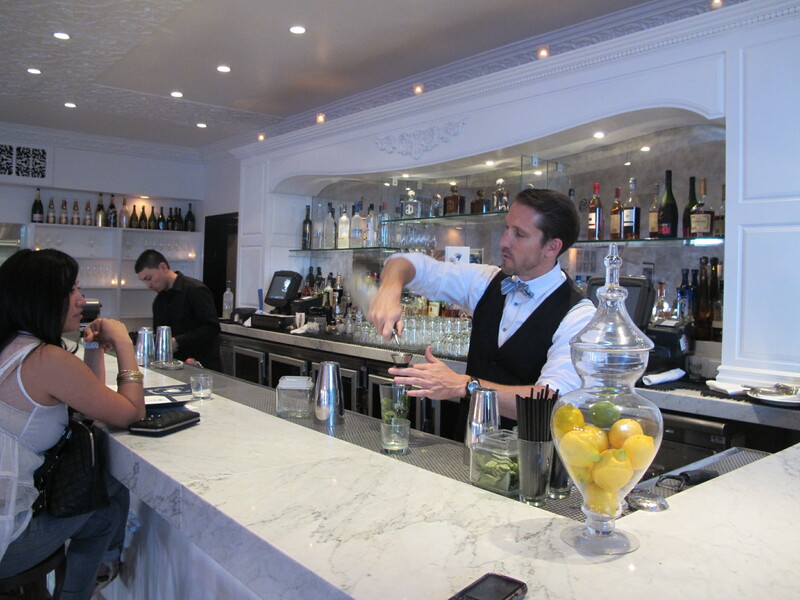 There are great options for the Mixology geeks of this town, as well as a couple of strategically placed vodka drinks that will appeal to the general Hollywood drinker. Zach himself is a wonderful character to witness in action, he’s always vibrant and full of energy behind the bar. I started with ‘The girl from Lima’ which was spicy but had a citric juiciness and slight sweetness. It got hotter the more I drank it but the passionfruit kept it balanced and drinkable. The second drink I tried I liked the most. The drink itself is hot pink due to the prickly pear puree. It had a great Basil nose, the Aperol helped prevent it from being overly sweet and the color was gorgeous. I think it would’ve worked well with Gin instead of Vodka, but I understand the need for a few Vodka drinks on a Hollywood drinks list so I didn’t complain. Tommy (my friendly bartender) told me that when they were trying to come up with a name for the drink the staff had at least 5 possible options and couldn’t pick one, then one day someone said “Hey Remember when hot pink was really cool?” and the name ‘Remember when’ stuck. 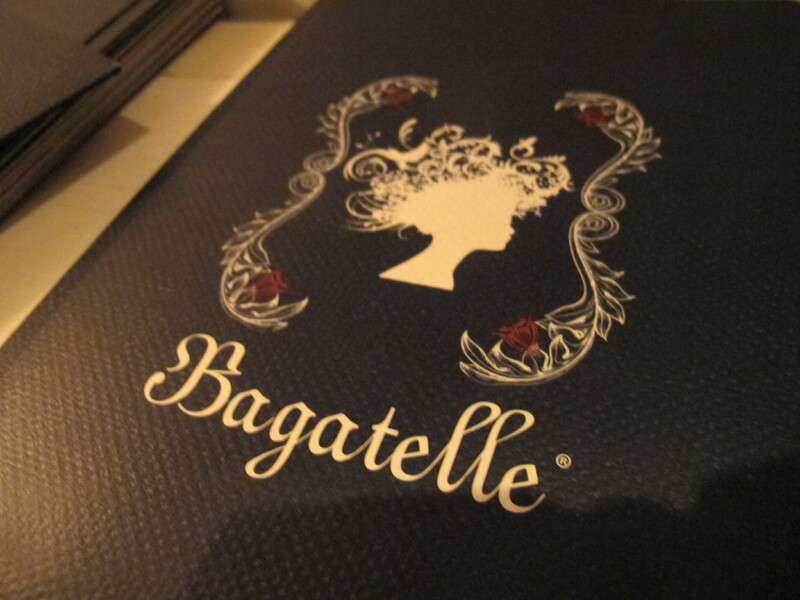 The food is french and although it was very good, I found it to be a little overpriced. The chicken dish was very tasty, the meat was succulent and juicy and I’m told the chef stuffs truffles under the skin which would explain the interesting and slightly salty flavor it had. I’m not sure it was worth the $50 price tag (thankfully I wasn’t paying this time) but it was certainly enjoyable. The beef tartare with little toasts was flavorful and easy to eat, it was lightly chilled, had a delicious quail egg on top and was nicely seasoned. I am not going to give a food rating this visit as I didn’t eat much just nibbled on a few items on the table (the chicken and tartare), but I feel like there are a lot of other dishes I should try before I give a rating. I stopped in mainly to see the new bar program and then stayed on for Aidan Demarest’s birthday party which was great fun! 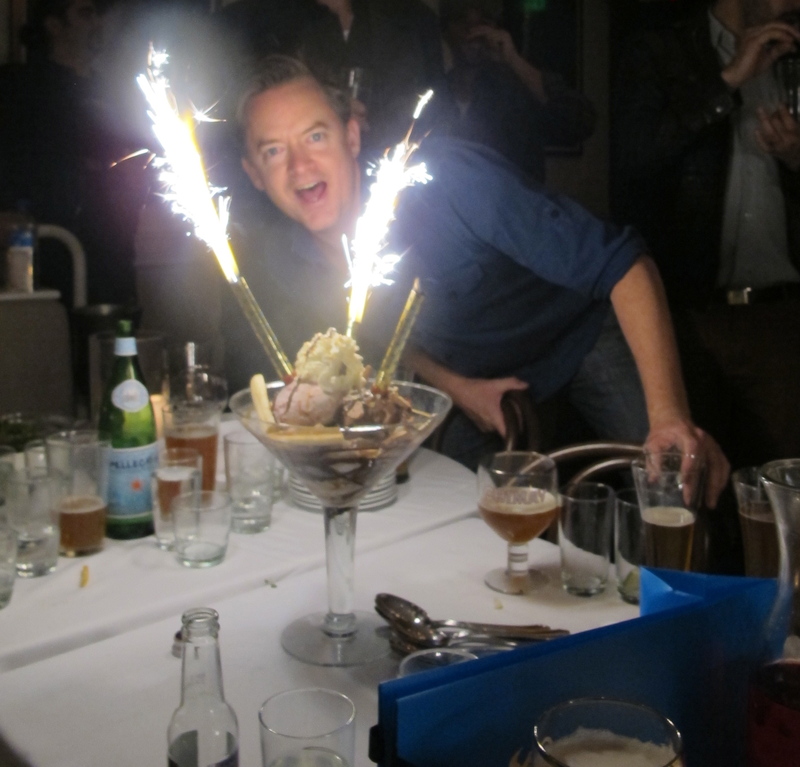 The ice cream sundae they brought out with sparklers was delicious and a great end to the evening. I will be sure to review the food in coming months, however what I did taste was well cooked, flavorful and nicely seasoned which is a good sign. Drinks get a good 3 out of 5 coupes. There was a good selection on the menu, the bartenders seemed knowledgable and the drinks I tried were tasty. I understand that vodka drinks have to be a prominent feature on cocktail lists in Hollywood, in order to satisfy the lambourgini driving, head to toe Ed Hardy wearing imbeciles that frequent most places at the top of La Cienega. I only wish there had been less of them on this menu and more Gin options. All in all its a pretty cool place to check out, the staff were really friendly and I found it to be a huge improvement on the pretentious club that was there before.